An odour-free water-borne concentrate that cleans and seals concrete porosity and offers Freeze Thaw Protection To Concrete. This is a non-toxic, non-acid concrete cleaner and sealer which may be applied to new or old concrete. Its powerful detergent combination flushes out oil and dirt from concrete, for a clean look and good adhesion of anything else. It contains no solvents whatsoever. One US Gallon of Smiths Permanent Concrete Sealer Concentrate, which makes 5 US gallons(19 litres) of Smiths Permanent Concrete Sealer. Protects against freeze thaw damage, cleans and seals porosity in concrete. Old concrete is chemically stable and its porosity fully developed. The typical age [at which chemical stability is attained, and chemically-bonded coatings will stick] depends on average annual temperature. All chemical reactions go faster in warmer weather, the rate doubling with every [roughly] eighteen Fahrenheit degree increase. Attaining this minimum degree of chemical stability typically takes two years in the latitude of San Diego, CA, or Miami, FL, or five years at the latitude of the San Francisco Bay in CA or the Chesapeake Bay in Virginia. In colder climates such as Seattle, WA or Maine this can take fifteen to twenty years. Such concrete does not develop further porosity with age, and is chemically stable. One series of treatments can completely seal the concrete, and the seal is permanent. Then a coating can stick and stay stuck. This is due to our 100% Acrylic-free™ formulation, based instead on the mineral chemistry of concrete itself. It will even stop salt – water deterioration of concrete pilings if the sealing is thoroughly done, and the concrete steam-cured [72 hrs@180deg. F.] before installation. Dusting and efflorescence of old concrete surfaces can be stopped entirely. However, old or extremely porous concrete may take more than two or three applications until no further penetration is observed. Extremely porous, crumbly concrete should be treated with Smith’s Clear Penetrating Epoxy Sealer™ or Smith’s Paving Brick Sealer™ instead. Most coatings can be made to stick to concrete, with proper surface preparation. Then, they stay stuck. New concrete will do most of its curing in the first few weeks, as the concrete capillary network and bleed holes show their development. The strength of concrete slowly continues to increase over the next few years, as a microscopic crystalline network develops. For this reason, we recommend that the application of the sealer to new concrete be repeated a year or two later in cases where absolutely no porosity in concrete may be tolerated. As concrete cures it will develop new porosity, regardless of how well sealed it was initially. Knowing this, the contractor can properly inform his customer and avoid call – backs and/or future headaches. Old concrete which may have absorbed food spills, grease or oil, antifreeze, brake fluid or hydraulic fluid will not stick if not chemically cleaned. Abrasive-blasting does not remove soaked-in contamination, and that such oily residue still dissolve in and come to the surface of the first coating to be applied. This is why a precleaner is necessary. The powerful detergent combination in Smith’s Permanent Concrete Sealer flushes oils or dirt from concrete porosity. This chemical surface treatment will also seal the microscopic porosity of the concrete. It also chemically activates the concrete and silica sand grains in the surface, so that a good chemical bond may be obtained with subsequent coatings. To use, mix two gallons of concentrate with three gallons of water to make five gallons of Smith’s Permanent Concrete Sealer™, ready to use. Apply Smith’s Permanent Concrete Sealer at a coverage of about 50-200 square feet per gallon, depending on concrete porosity. Apply as much as immediately soaks in. The average concrete slab takes about 100 square feet per gallon. One should apply as much as will soak into the concrete. It is then covered with a plastic sheet to prevent water evaporation. Do not let any of this sealer dry hard on the concrete surface; it will be difficult to remove and will interfere with adhesion of subsequent coatings. The seal develops by a chemical reaction with the concrete, and this is a fairly slow reaction. Keep covered for five hours at 77F/25C [longer in colder weather]. Then the plastic sheet cover is removed and the concrete is rinsed with tap water while being scrubbed with a stiff bristle brush or push-broom. At this point the concrete surface should show water standing, not soaking in. There may be patches that do not show a glossy film of water after rinse. This demonstrates the natural, irregular and variable porosity of concrete. These areas need another application of Smith’s Permanent Concrete Sealer. The entire area may be treated after allowing a few days for the excess water to evaporate back out of the remaining porosity of the concrete. When Smith’s Permanent Concrete Sealer is applied, it will only soak into the areas that have porosity. Make sure you apply enough to saturate all the remaining porosity. Seeing a glossy film of water everywhere after treatment and rinse, is the evidence that the concrete has been sealed against liquid water and oil absorption. It can still pass water vapour, however. This seal is based on a mineral kind of chemistry similar to the concrete itself. Acrylic-emulsion-type sealers and organic silane sealers biodegrade and weather away, and need to be repeated. Our technology is 100% Acrylic-free, and on fully cured concrete, this seal is permanent. This treatment is sufficient to seal concrete against efflorescence. The cause of efflorescence, the white stains commonly appearing on concrete, is dissolved minerals left behind when underground water evaporates from a brick or concrete surface. When the concrete surface is treated in this manner, liquid water underneath cannot reach the surface. This sealer passes water vapor only, thus the evaporation of the water takes place below the surface. The dissolved minerals [usually calcium carbonate, limestone] are deposited within the concrete, below the surface where they cannot be seen and actually contribute to further sealing and densification of the bulk porosity of the concrete. 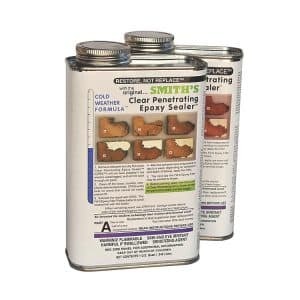 Smith’s Permanent Concrete Sealer is completely safe when used as directed. It leaves no toxic residue whatever and may be used in bath and shower areas where bare concrete must be sealed to prevent water intrusion into the sheetrock and wood behind grouted-tile surfaces. It may also be used on concrete surfaces which hold animal food, or in food preparation areas. Regular sterilization with steam or hydrogen peroxide will not affect the sealed surface. As a general Company policy, we do not allow any of our products to be used where they may come into direct contact with human food. Where such requirements exist, we recommend that you find a manufacturer who offers U.S. Government-certified “Food Grade” products. Some stucco or sprayed – concrete surfaces exhibit higher porosity, and after the usual procedure some absorption of water may still be apparent. Concrete blocks are an extreme example. This sealer should not be used on such surfaces. The subject of sealing the very large pores of concrete blocks is covered in a separate application note How to Seal an Unpainted Concrete-block Wall from the Inside, using our Damp Concrete Primer. Below – grade concrete basement walls may be sealed from the inside, providing the work is done during the dry season, when ground-water is not flowing in. Flowing water would prevent sealer penetration. Actual cracks in concrete may be sealed with rubber sealants. If the concrete slabs have absolutely no capability for movement, epoxy or cement grouts may be used to seal cracks. 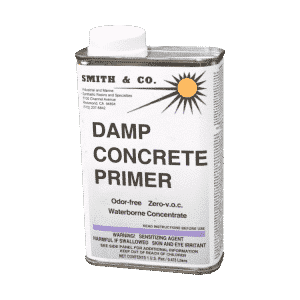 See the product page Smith’s Damp Concrete Primer and its application note, Render Crack Repair. White or coloured stains or powders may develop on the surface in the days or weeks after Sealer application. The particular history of the concrete is responsible, and this cannot be predicted in advance. Application on a small test area is recommended, where the concrete has an unknown history and final appearance is of concern. See Freeze Thaw Damage for how to use it to protect against Freeze Thaw Damage.